Within a short distance to Big Buddha, Fisherman’s Village, etc. Skye Beach is a wonderful, modern retreat in Koh Samui with stunning beach frontage of Plai Laem beach. Explore the stunning ocean from the white sandy shores that lie right at the edge of the villa. 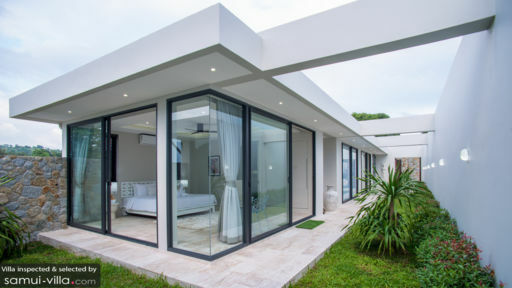 Skye Beach Villa is a cluster of four interconnected villas — Villa Neung, Villa Saam, Villa See and Villa Song — which in total comprises eight stunning bedrooms, a spacious living area, and a spectacular outdoor area with a gorgeous swimming pool. The modern and elegant interiors are bathed in neutral shades of greys, whites, and earth-tones. This house is perfect for large gatherings where families and groups of friends can get together for a special event such as a wedding or a birthday party. As you enter through the wooden doors, you will be first greeted by two parallel pavilions housing the eight bedrooms at Skye Beach. 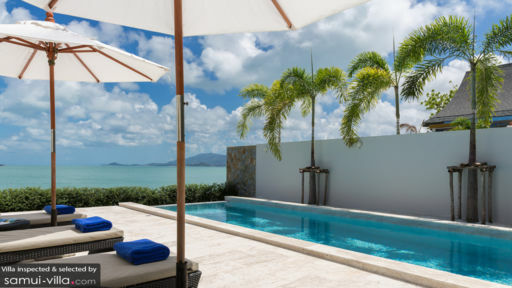 The villa prides itself in providing some of the most covetous views in all of Samui. The bedrooms are spacious, well-furnished with king-sized beds, ample wardrobe space, and the best part has to be the sliding glass doors that lead you to paradise. The air-conditioned bedrooms provide the most amount of comfort, modern amenities, and luxe interiors. En-suite bathrooms accompany the bedrooms for ease and convenience fitted with necessary amenities. Awash with white sandstone and marble floors, the glistening swimming pool at Skye Beach is an arresting blue amid dominantly lightly-coloured surroundings. Beyond the swimming pool, you get a most spectacular view of the expanse of the ocean without any interruption. Framed by neighbouring isles, the ocean makes for a spectacle with overwhelming sunsets over the horizon. Lounge on the rattan sunbeds, sip on some evening cocktails courtesy of the staff, and enjoy the serenity in this part of Samui. Skye Beach has been beautifully designed incorporating the natural elements of Samui’s stunning coastline within and without its walls. Well-kept gardens, luscious flora, and pavilions connected with beams create a modern architectural marvel. The main living area is swathed in white with an entire wall dedicated to floor-to-ceiling glass doors. Open them up to be wowed by the most mesmerising view you ever did see. Furnished comfortable with a plush couch, armchairs, and a massive flat-screen TV on the opposite wall. 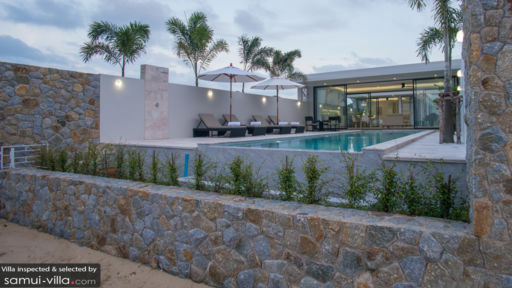 The fittings and fixtures are edgy and modernistic keeping with the contemporary theme of the villa. The room is air-conditioned in case you wish to close the doors and enjoy a cooler ambiance. There is even an amazing media room with lounge seating and a projector screen where you can view movies on repeat. Guests have the option to dine outdoors, alfresco-style, or indoors in the main living area. There is ample seating for guests of the villa to relax, unwind, and enjoy your time. You have access to a fully-equipped kitchen with complete amenities and modern appliances. Bake a cake or a loaf of bread, cook up unique concoctions, and let the ocean inspire you to do beyond what you have imagined. There is concierge service provided to guests of Skye Beach and they can help to arrange for any special activities such as massages, tours and travels, excursions, and Thai cooking classes, among other things. You can avail these services at an extra cost. Serene and tranquil surroundings make Skye Beach a premium property for a memorable trip with friends and family. Located on Plai Laem beach, the villa is close enough to numerous restaurants, cafes, and boutique stores. Explore the area where you have the famous sight of Big Buddha. Visit the historical Fisherman’s Village which is one of the few remaining establishments that will let you see the old Bali.